There are several artists with the name "Luke": 1) Luther Campbell (aka Luke), former member of Miami hip hop group 2 Live Crew 2) There is also a Danish electronic band named Luke. They have released two albums on the Music For Dreams label. 3) Luke De-Sciscio (aka Luke) is an acoustic songsmith. 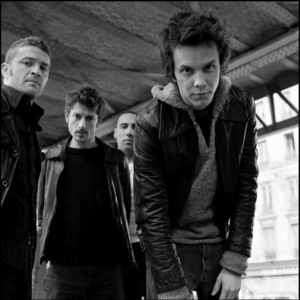 4) French rock band formed in Paris in 1998. Wikipedia With many ?beautifully constructed tracks, his dizzying falsettos confuse and delight the senses', whilst ?the honesty and poetic nature of his lyrics spin a web around your own heart'. 2) There is also a Danish electronic band named Luke. They have released two albums on the Music For Dreams label. 3) Luke De-Sciscio (aka Luke) is an acoustic songsmith. With many ?beautifully constructed tracks, his dizzying falsettos confuse and delight the senses', whilst ?the honesty and poetic nature of his lyrics spin a web around your own heart'. This young performer has played many gigs around the south of England and continues to perform developing a loyal fan base. 5) Band that incoporate French as well Spanish into the lyrics of their rock-pop songs. 6) A techno DJ from Berlin, Germany connected to Tresor Records. 7) A Chinese atmospheric folk/dark metal one-man project from Suzhou. Released one demo, "Lake of Mirror" in 2011. 8) Pop Singer/Songwriter/Producer from Toronto, ON. He is currently working on his debut album. 9) Luke is an alias used by Luca Torchiani for the Super Eurobeat series. He is under the Eurobeat label "Delta Music Industry". He released 2 songs on the Super Eurobeat series such as "The Champion" on Super Eurobeat Vol.197, "Go Shinkansen!" on Super Eurobeat Vol.202 with Cherry (Clara Moroni) and "Time Fighters" on Super Eurobeat Vol.215. He also has 2 unreleased tracks that were finally released on the "Eurobeat Masters" compilations by Delta (some were illegal) such as "Turbo Disco" and "Dangerous Speed Cars".